Effective Presenting – How often have you switched off (even for a few seconds) when attending yet another PowerPoint Presentation at work? Our experience is that this probably happens more than 9 times out of 10. So that’s about 90% of PowerPoint presentations where the lack of PowerPoint presentation skills actually undermines the very presentations PowerPoint is supposed to enhance. So why do people continue down this road to presentation anesthesia? And can we divert at least some of them to a more enlightened, creative approach? Here are seven PowerPoint presentation skills tips to help you on your way. Do you really need to use PowerPoint? Next time you’ve a short presentation or talk to deliver, rather than immediately starting up PowerPoint to get the slides ready and using it again when you are delivering your presentation, think about what you want to say and how you might do that without using PowerPoint at all. Check out our article on how to prepare a presentation to get some good tips on creating and structuring a presentation. Then have a look at Tip 2 to see how to avoid using PowerPoint to prompt you. Stop using PowerPoint as your prompt! Once you know what you want to say, try and condense the words into a series of key phrases (prompts) that you can then refer to as you start to deliver the presentation. Then put your prompts for the talk onto record cards (white sheets of cardboard roughly 6″ by 4″). Just like the photo on the right. We use them all the time when training people in presentation skills. If you absolutely have to use PowerPoint during the presentation then use it as sparingly as possible. Be ruthless in removing the unnecessary slides. Use prompt cards for your prompts so remove any slides that might just be for your benefit. Then review the set of slides AGAIN against your presentation and remove any more slides that you possibly can. Hopefully by now you’ll not be using PowerPoint slides as your prompts – so much of the text heavy bullet points will have disappeared. But remember that ideally PowerPoint is a VISUAL aid that’s there to enhance your presentation – to help you get your message across and achieve your objectives. Real visuals (ie Pictures) can help create feelings in the audience, can help make a complex process easier to understand etc. So think carefully about opportunities you might have in your presentation to use pictures, graphs etc to compliment what you are saying and to help you get your message across. If you must include some text in the presentation then pull out only the headline or summary information. Keep to a maximum of 3 lines of headline text (summaries) on a slide and one slide title. And make sure that each headline uses large fonts. Aim to keep to 4 or 5 words maximum per heradline. Try and include an image on the page as well to compliment the text. But don’t use the clip art that comes shipped with PowerPoint. Try a resource such as www.istockphoto.com or similar for photos. If you have to provide a set of handouts for your audience after the presentation then do so. But it doesn’t need to be just copies of your PowerPoint slides. Don’t constrain your presentation slides (if you’re using some) by having to include all the facts and figures that you might need to get across in your slides. Keep the detail for the handouts and only have summary headline text on the slides. If you are likely to have questions either during or after the presentation then as part of your preparation you’ll probably spend some time brainstorming the likely questions and deciding how best to answer them. So if you’ve the time, and only where appropriate, include one or more “hidden” slides that will help you answer some of the most difficult questions that you might get asked. For example if you are talking about a process or a strategy in your presentation and have only covered things at a high level in your slides, then it might be useful to include a more detailed diagram of the contentious part of the process (for example) on a hidden slide that you can refer to ONLY if needed. If you can then dont use PowerPoint at all. 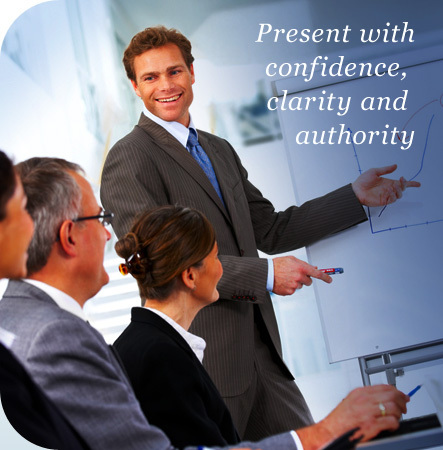 If you have to use PowerPoint, then use it for the audience’s benefit and use it as sparingly as possible. And remember it is supposed to be a VISUAL aid so use it for visual images and not just bullet points!